We've all been there. Trying to relax or to calm down but being unable to because our thoughts are running wild. Be it generalizing a small negative event into different aspects of our lives, catastrophizing what just happened in our heads, or just spiraling deeper and deeper into a negative place. All because we cannot control our thoughts and cannot get ourselves to calm down. Our body is present, but our mind is somewhere completely else. 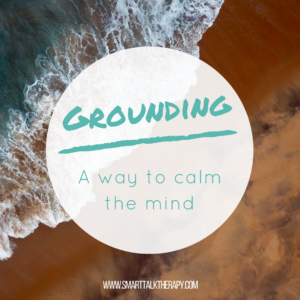 This is a time where grounding might come in really handy. 4. What do you taste? 5. What do you feel against your skin? The more details you give, the better. Once you are done answering all five questions, check in with yourself and see if you are calmer than before. Most of the time when we do this exercise with clients, they don't remember what we talked about right before starting it and usually feel a little embarrassed about that until we tell them that that is exactly the point of this exercise. Try practicing this exercise at first when you are alone and calm so that you can get the skill under your belt before trying it out when you are stressed. Learning grounding is similar to learning the safety instructions when you are flying on an airplane. They go over the safety instructions with you as you taxi to the runway rather than in the actual emergency so that you are at your best self to actually absorb the vital information. Also, please try to do this technique consistently (at least 1x/day) for about two weeks before saying "it's working" or "it's not working". These techniques are somewhat like taking antibiotics in the sense that it will require a few doses before you notice a difference.